I know I'm a bit late with this update but...is it really ever too late to post about the hotness that is Mormon rocker, Brandon Flowers of The Killers? I don't think so. 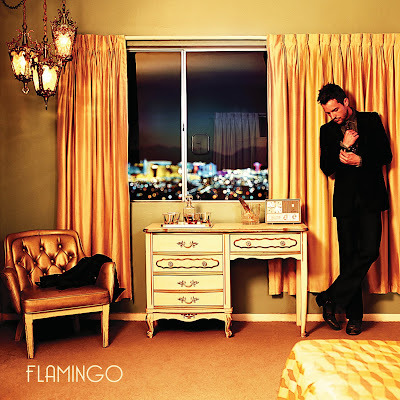 THIS is the album artwork for his debut solo album, entitled Flamingo. It's a bit cluttered, as far as album artwork goes. Lots of THINGS in the room. Off course everything is in a nice golden-bronze sheen except for Flowers who draws the focus in a nice dark suit. Flamingo, which features production from Stuart Price, Daniel Lanois and Brendan O’Brien, is due out September 6th in the UK and September 14th in the U.S., courtesy of Vertigo/Island Records. The first single, "Crossfire" was released digitally in North America on June 21st and will see the light of...iTunes...in the UK on August 23rd. The music video features Oscar-winning actress Charlize Theron in a surprisingly meaty role as heroine to Flowers' damsel-in-distress. So far the song has peaked in the Top 20 on Billboard's Rock and Alternative Rock charts. The song has apparently been remixed by Chew Fu (GOD I hope this is true). According to Pop In Stereo, Flowers will be setting out on tour to support his album, this summer. Playing five dates in August, Flowers will get things started on August 15th at the Las Vegas Hilton. Mmm Mmm Mmm. Mark Ronson is one good looking dude. Even when his face is created using a multi-colored patchwork effect. Still HOT. 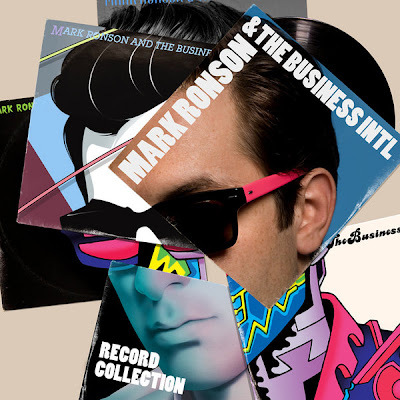 Ronson's forthcoming third album, The Record Collection, isn't out here in the States until October 5th but I don't know if I can wait that long. I might have to splurge on a UK import when it's released on September 27th. Yeah, only a few days but that's a few days too many with out Mark Ronson & The Business International. First single, the Q-Tip and MNDR assisted "Bang Bang Bang" debuted at #6 on the UK Singles Chart. Check out the AWESOME video if you haven't already. Remixes come to us from Russ Chimes, Count And Sinden and SBTRKT. Needless to say, The Record Collection is one of my most anticipated albums this Fall. God. It seems like Hex Hector and Mac Quayle have been M.I.A. for SO LONG. I remember when these guys were mixing EVERYBODY from Whitney Houston, Patti Labelle, Toni Braxton, Annie Lennox, Britney Spears, Anastacia and many many more. Pretty much every mix that I heard and loved was by Hector or Quayle or some combination of the two of them. Of course, this was back when I wasn't too familiar with dance music. I liked the occasional dance remix of a Top 40 song but I wasn't going dancing. Something about hearing a remixers interpretation of a popular song intrigued me. I couldn't get enough...even if I was just WALKING quickly across campus to the thumping bass. I don't think much has changed, in that I still go CRAZY for dance remixes...and the fact that I don't go "clubbing" remains the same. Where as before, my taste in dance music was pretty one note...now I'm a bit more well versed in the genre now. I have branched out and like different kinds of dance music. That all being said, I'm still a sucker for a good 'old fashioned' Hex Hector/Mac Quayle remix and their new mix of Christina Aguilera's "You Lost Me" really takes me back...to the 2000s. If THIS is what the radio edit sounds like I can only imagine how EPIC the full length mix is. 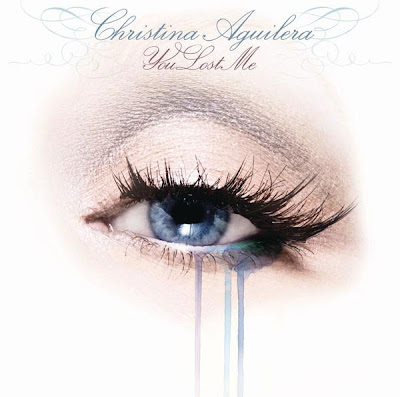 "You Lost Me" is the official second US single off of Aguilera's new album Bionic. The song was produced by Samuel Dixon and co-written by Aguilera, Dixon and singer/songwriter Sia. By itself, the song is a heart-wrenchingly beautiful ballad. Aguilera sounds ever so slightly restrained, which isn't a bad thing in this case. Aguilera is known for her BIG voice and crazy, out-of-this-world riffs. This ballad is sung softly and poignantly. Perfectly. What I LOVE about this remix is that it doesn't muck that up. While it doesn't make use of the orchestral track, it keeps the poignancy of Aguilera's vocal in tact, particularly in the chorus. So expertly done. Then again, I would expect nothing less from two pros like Hector and Quayle. Um...don't hate me but I kind of love this song...and it appears that I'm not the only one. Entertainment Weekly named "Drank" by Girlicious as one of THE songs to download on the just released soundtrack to MTV's trash-tastic reality show Jersey Shore and I quite agree. I've always had a soft spot for Girlicious (Nichole Cordova, Natalie Mejia and Chrystina Sayers), ever since watching the CW reality series (with about 10 other people TOTAL) where girls competed to be THE next pop group under the watchful eye of creator Robin Antin (The Pussycat Dolls, Paradiso Girls). Sure, they've never released an album here in the U.S., (opting instead to target Canada) but they left me with a lasting impression. "Like Me" was a great song. No, nothing ground breaking, but a decent slice of urban-influenced pop music. "Stupid Sh*%" was...well...stupid but still fun. And "Baby Doll," it was cute. Girlicious are were cute. After losing Tiffanie Anderson for whatever reason, the girls forged ahead, left Geffen, signed with Universal Canada and released two new singles, "Over You" and "Maniac," neither of which made much of an impression on the Canadian charts. NOW - with the release of "Drank," it appears that they're SKANKING things up a notch and I LOVE it. "Drank" is no more genius than their previous efforts but that's not LIKE...what you were expecting...was it? HELLO! It's the Jersey Shore soundtrack! I hope to GOD there's going to be a video for this one.